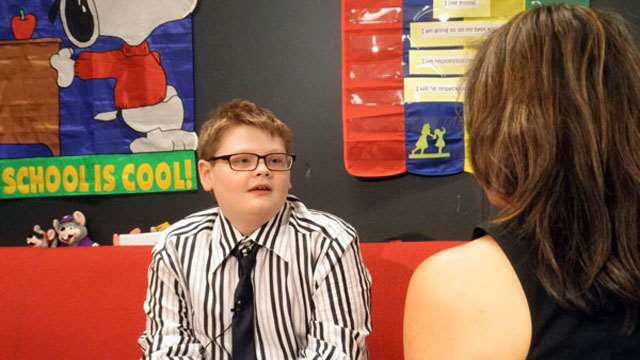 LOUISVILLE, Ky. (WDRB) -- Over the past several months, the community has gotten to know 10-year-old Dennis Burrage, who is one of 12,000 homeless students in Jefferson County Public Schools. "It's actually been a pretty rough year until now, these upcoming weeks," Burrage said. "It's been pretty hard." In his new shirt and tie, you'd never know what Dennis Burrage has gone through. The fifth grader has been living at the Volunteers of America shelter up until a few weeks ago. Now, he's no longer homeless, sharing a small house with his dad and his dad's friends. "Basically, right now, since we don't have much money and the rent is kind of high, as long as they are with us [and] they are working too, we may be able to get past the rent," Burrage said. After we first aired Dennis' story, there was a huge outpouring from the community which made it a very nice Christmas for Dennis and other families at the VOA. Dennis says he has this message for kids who are in similar situations, "If you just hold on and make everything feel just right where you are staying and you might be able to have what all the other kids have some day." At fifth grade graduation, Dennis received the "Ducky Award" for perseverance. No matter what problems arose, he still overcame them and served as a positive role model at school. "I'm just very proud of that young man," said Stephanie Hooper, the Family Resource Center coordinator. "We've had several other students in the same situation and Dennis has wrapped his arms around those people. That's one thing he didn't tell you. Others weren't afraid to tell what their situation was like." Dennis is hoping someday they'll have enough money to have their own house. He said, "It would be pretty amazing to actually have your own place without having to share it with other people." Dennis says he'll soon be gracing the cover of a VOA magazine and poster. His dad is still in between jobs looking for something full-time. Dennis said, "It's nice knowing that you have a father that is trying to stop the situation from happening again." Since Dennis just moved, school official are helping him figure out where he'll go to middle school for the next school year. He's sad to leave Camp Taylor, but is excited about going to a new school.